Double curtain rods by Kirsch. White finish. Lockseam, double, 2" clearance. Includes brackets for mounting. Uses include double curtain treatment, sheer in back, privacy fabric in front and also used with a curtain with valance. A commitment to quality. Our commitment to quality is steeped in tradition. Whether it's inspiration you seek or innovation you crave, energize your creative spirit with the drapery hardware collection by Graber. 4-122-1: PVC clear curtain rods 28-48"
Iron Art by Orion swing arm curtain rods are available up to 36 inches in length. Base price is for a 12 inch rod. Ball finial shown included. Mounting base measures one inch wide by four inches high and projects one-half inch off the wall. Approximate two to three week delivery. Antique white finish. A cafe curtain rod by Kirsch. Spring pressure shower rod. 2 1/2" wide face by 24-36 inches long, white finish, by Kirsch. White finished metal sash rod for french door curtains. Use one on top and bottom to secure the curtain to the surface of the door while opening and closing. Extends 28 to 48 inches in width, lockseam metal construction. This versitile package doubles as a corner curtain rod and a bay curtain rod, all at a very good price. The item includes two side sections and a rear section. For a corner window, just eliminate the center, or rear, section, and for a bay window, use the two sides and the rear section. White finish. Projection 2 1/2". Two side sections 18-46", one rear section 36-63". Arch curtain rod same as Kirsch 7015-058 but has outside mount hardware. Comes in 2 sections that fit together with included splice. Curved curtain rod finished in clear to go with any curtain fabric. Projects 2 1/2 inches, forms arch with 4 to 12 inch radius. Tube width is 5/8 inch. Arched drapery rods with a commitment to quality. Order Quantity 1 each, clear finish. Double rod curtain rods by Kirsch. Lockseam, double curtain rod. Corner curtains or angled windows can be a challenge. Corner window solution. Strong steel construction finished in white. Comes with one support bracket and has a clearance from wall of two inches. By Kirsch curtain rods. Super heavy duty. White finish. Projection, 2 3/4 to 4 1/4 inches. Clearance 2 to 3 1/2 inches. A commitment to quality. Note: one way right pictured. Graber super heavy duty features include a universal front loading end bracket, metal adjustable and reversible master carriers ball bearing end pulleys, a spring loaded side gate for adding or removing slides, molded, canted slides, can be converted to one way draw, scored center support base for easy mounting on narrow casings, universal cam lock stirrup, braided polyester cord, and angled tip on overlap arm. Clear sash curtain rod 12"-20"
Clear curtain rods by Kirsch. 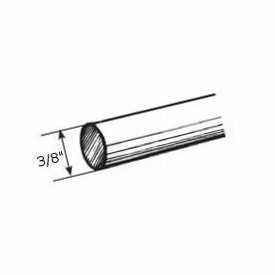 7380-058: Clear sash curtain rod 20"-36"
These pins are used to attach pinch pleat draperies to your traverse rod. The pin attaches to the back top of the drapery, pinning into the header. The hooks go into the slides on the traverse rod. 14 per bag. Curtain rod hooks by Kirsch.